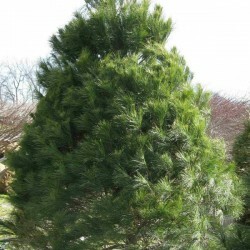 Valued as a landscape and lumber tree, white pine is a stately, fast-growing evergreen with supple green needles and dark grayish brown bark. 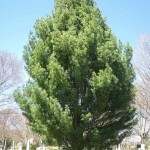 It is distributed across the eastern half of North America, from Newfoundland to Georgia, and grows best in open, upland areas with well-drained soils. 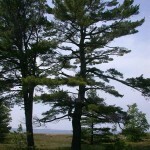 Mature specimens become very tall, have straight trunks and broad, pyramidal crowns. The long, flexible needles come in fascicles (groups) of five. These are fully evergreen and shed every two to three years. 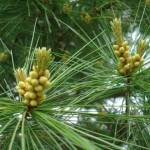 Separate male and female cones are produced in spring. The candle-shaped male cones release copious amounts of airborne pollen which drifts to the large conical female cones. The female cones are olive-green and rubbery when young, brown and woody at maturity. Female cones release winged seeds their second autumn, falling from the tree shortly thereafter. 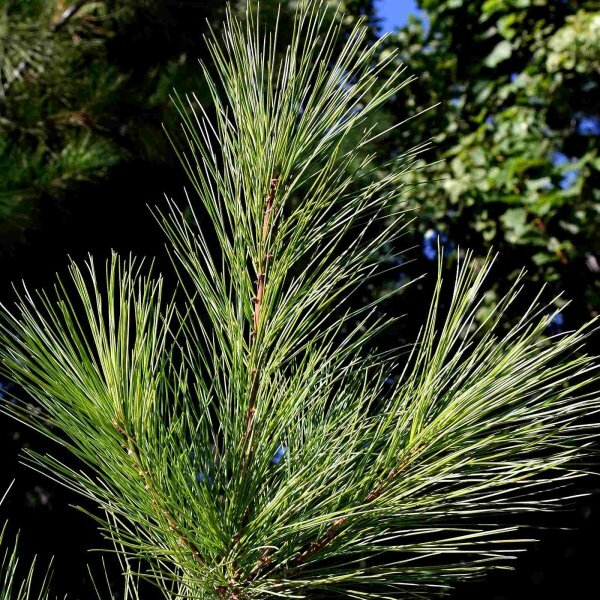 White pine grows best in full sun and well-drained sandy loam. It is moderately weak-wooded and can be damaged by heavy snow or ice. It rarely needs pruning but can be limbed up as needed. 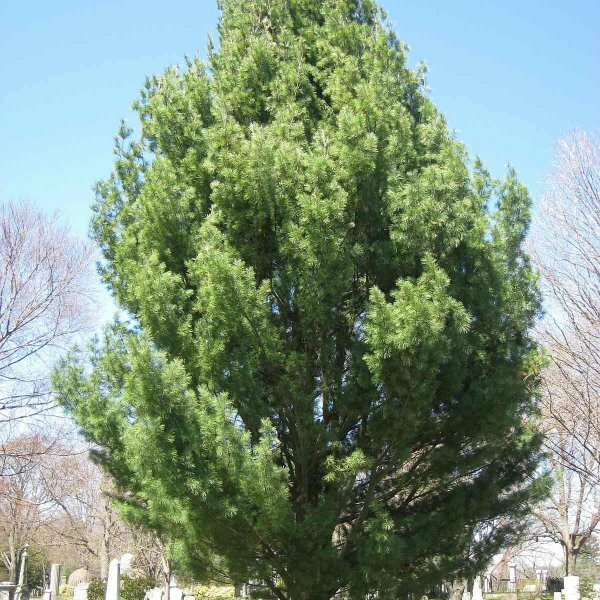 The serious fungal disease, white pine blister rust, causes branch and stem cankers and heavy die back, which can devastate trees. The disease is carried by currants (Ribes), so avoid planting them nearby. Seedlings and young trees are most susceptible. Germination 24 hours soaking and 30-45 days cold moist stratification can be done. Freeze 12 hours then 12 hours room temperature imbibed seed. Do 12 cycles then sow. 1. Fill small pots with compost. Place one or two pine seeds on top of the compost in each pot, then cover the seeds with a thin layer of sand. 2. Water the sand and compost to add moisture, then place the pots in a warm, sunny location. As the seedlings emerge and grow, the soil needs to remain moist, not wet. 3. Repot the pine trees into medium-sized pots in the fall. Grow them in the pots for the following season until they are large and strong enough for transplanting into the landscape.